I made this delicious cauliflower pasta for the first time this winter and immediately loved it. I had seen this recipe and liked the idea but it was one of those weeknights when I had cauliflower and pasta but not much else from the original recipe and I was tired and hungry so I used what I had already. In one of those happy accidents of leftovers alchemy, I liked my version so much I never went back to try the original inspiration. I knew I wanted to share the recipe here but there was a problem. Nutty roasted cauliflower, green picholine olives marinated in coriander and herb de Provence, smoky sweet piquillo peppers, creamy salty tangy sheep’s milk feta – it was delicious and satisfying. But if the explosion of Pinterest has illustrated anything, it is that people like to cook food that not only sounds good, but looks good too. We want the whole package. And when I take pictures of some things I cook, the visual just don’t do the flavor justice. Some dishes just aren’t as easy on the eyes as others. Don’t judge this recipe by its looks alone. Get to know it. Look for its hidden depths. Because, really, it has a great personality. Heat the oven to 400. 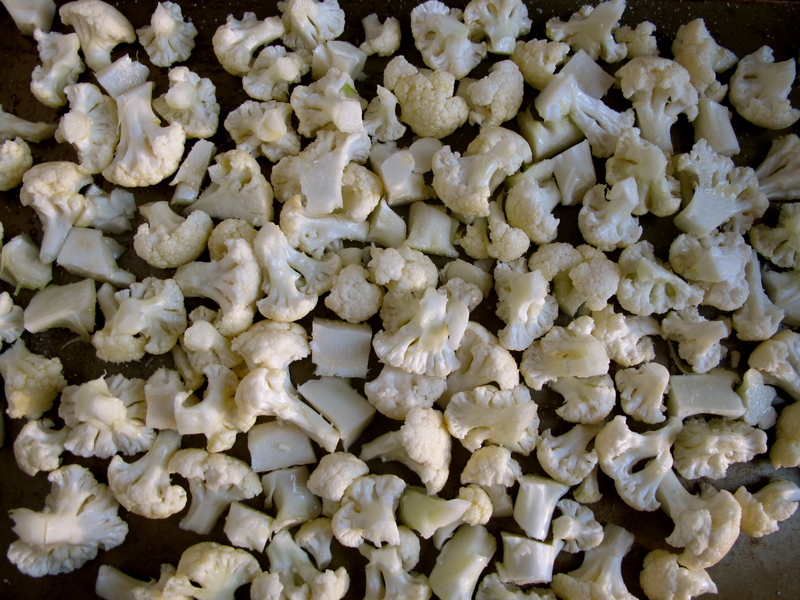 Separate the cauliflower head into small florets, cutting the stems and bigger florets into bite sized pieces. Toss with just enough olive oil to lightly coat, spread the florets out onto a big baking sheet and roast until the bottoms and edges start to brown, about 20 minutes. stir the cauliflower once to make sure the bottom isn’t browning to quickly, but otherwise leave it alone. Meanwhile, begin to bring a pot of salted water for the pasta to a boil. 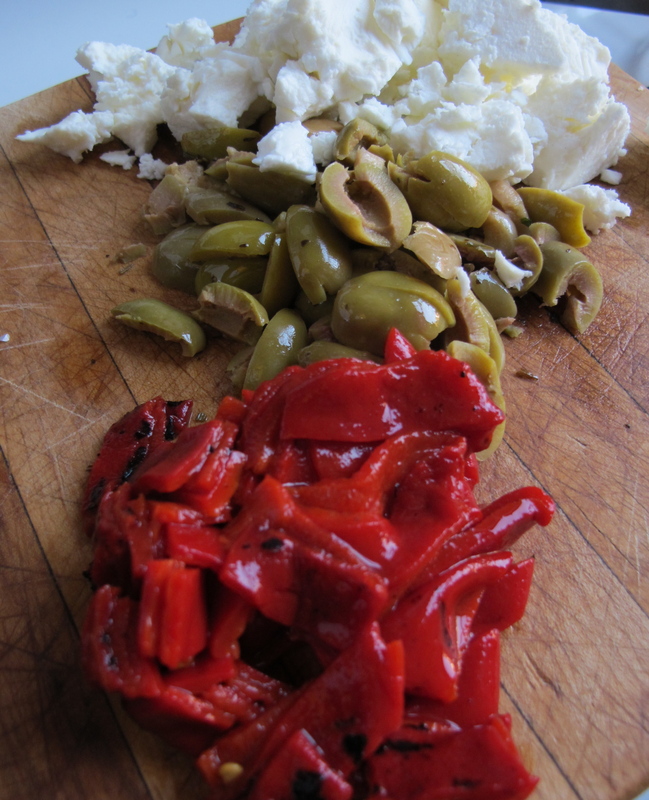 Get the olives, peppers and feta ready to go; if the olives have pits, smash the olive on a cutting board with the bottom of a glass or the flat side of a knife blade. 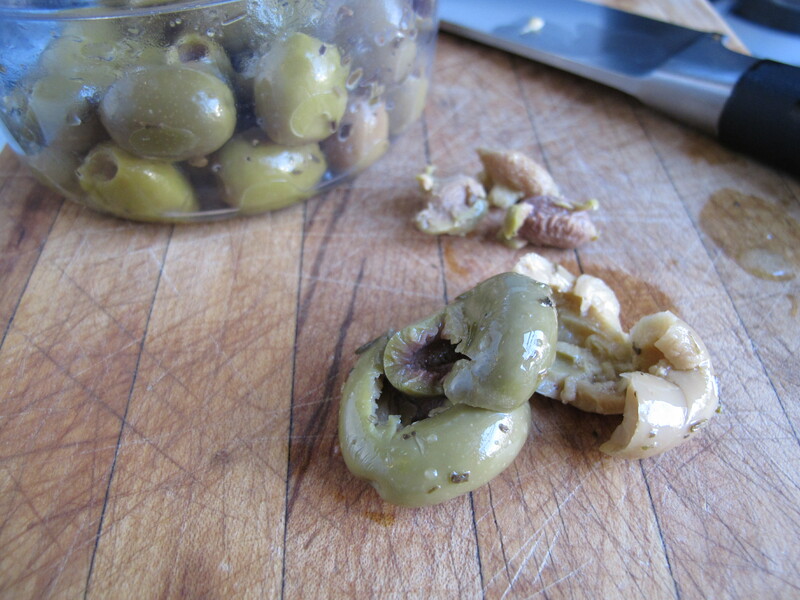 The pit will be loosened and the olive will be easy to chop. In a large saute pan, pour about a tablespoon of olive oil over low heat; add the crushed green peppercorns, anchovy paste, and garlic paste and allow the garlic to just cook through. Stir once in a while to keep the garlic from sticking and burning. Toss the panko crumbs with a little olive oil and toast the crumbs, either in a skillet on the stove or in the oven. Keep and eye on it; the oil makes it brown quickly. Cook the pasta; since it usually takes about 10 minutes, give or take, start it a little after halfway through the cauliflower’s cooking time. Remove the cauliflower from the oven and add it to the pan with the garlic. Gently stir to infuse the cauliflower with the garlic mixture, then mix in the peppers, feta, and olives. scoop the very lightly drained pasta into the saute pan with the cauliflower mixture. That splash of starchy water will keep the whole thing moist without watering the flavor down. Toss the crumbs through the pasta just before serving. Finish with a little drizzle of fragrant olive oil. *Brined green peppercorns come in a jar and look very similar to capers. They are pungent and have a lemony pepper taste that is great with a wine sauce on fish or chicken or in a creamy vegetable dip. Their flavor is midway between black and white peppercorns. In the brine, they keep indefinitely. 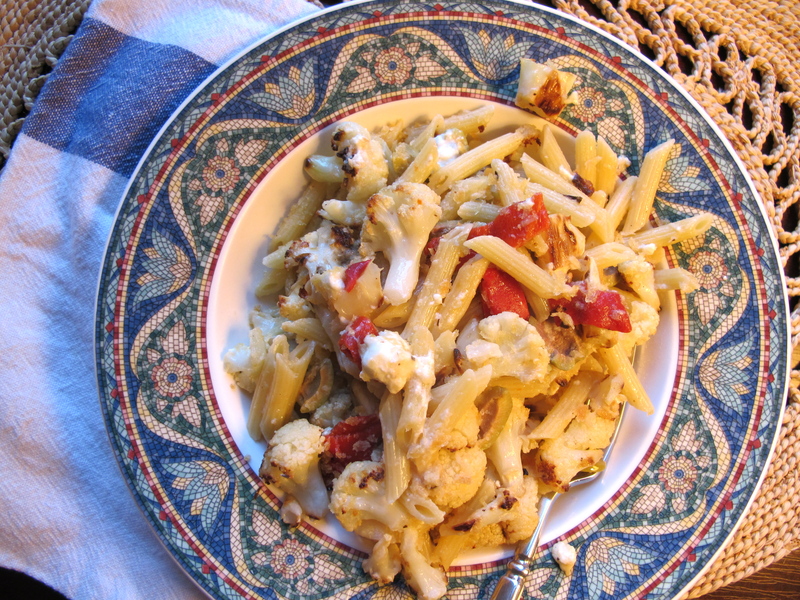 There is a much simpler cauliflower-olive pasta in, I think, Deborah Madison’s Vegetarian Cooking for Everyone. This one has more going on and sounds better. But I frequently find myself, especially in winter, serving an all brown-and-white plate. I just go with it. Roast chicken, mashed potatoes, applesauce; nobody complains about actually eating food that tastes good and looks attractive but monochromatic. (That’s what pickles are for, anyway. Nothing like chowchow for color.) But in photos, no, it would look terrible. Lots of things look great in real life and lousy in photos. As long as you eat in real life, you should be good with this stuff.